Should I Replace All Of The Locks If I Lose My Keys? Losing the keys to the house can be an absolute nightmare for any homeowner. Losing the keys can mean having to wait outside in order for the Perth locksmith to show up and let you inside the house. Another worry for you might be the fact that you don’t want anyone to access the house if you have lost your keys whilst you are out and about in town. This means that you need to decide if you should replace all the locks in your house. Action Lock has years of experience when it comes to changing the locks inside an entire house. Read our helpful guide containing all the things that you should consider if you want to change all the locks inside the house. You might be worried that someone will access your house if you have lost the keys from your purse or your pocket. Whilst the likelihood of getting burgled by someone who finds your keys are small – because of the fact that most keys don’t display a street name or a number on the keyring – it is worth considering changing all the locks. This will give you peace of mind that your house has been made secure from the threat of burglary. Action Lock has a sturdy range of locks which won’t be accessible for potential burglars. Changing the locks won’t just help to give you peace of mind – it will provide viable protection for your house. Changing the locks in this manner is recommended on an annual basis, even if you don’t happen to have lost your keys. Burglars will be unable to use the keys even if they found them lying on the street outside your front door. You might think that changing the entire set of locks is excessive, especially if you only happened to have lost a set of keys and not been burgled. However, this is not the case and changing the entire set of locks on the house does not have to break the bank. Action Lock provides full lock refits on houses for an extremely cost-effective price. This will allow you to feel completely safe inside your home without bemoaning the fact that your bank balance has taken a big hit. Then you will be able to get on with your day to day lives. If you happen to lose or damage your primary set of keys in the future, it will be extremely frustrating if you are left without a backup. 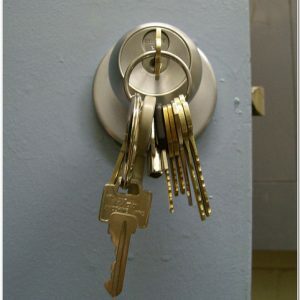 That is why you should have a spare set of keys cut in order to provide backup if you happen to lose another set of keys. If you have lost your keys, Action Lock can make sure that the locks get changed. Contact us today.